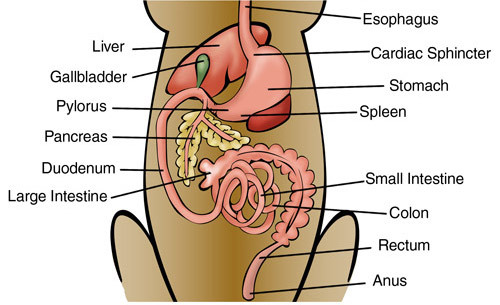 A dog’s digestive system is one of the shortest in the mammal world. Unlike humans who have amylase in the saliva, a dog’s digestion does not begin in the mouth. Aside from chewing food to allow for easier swallowing, there’s no digestive breakdown in a canine mouth by salivary enzymes. The breakdown of food and nutrients begins in the stomach where, in conjunction with various organs (pancreas, liver, small intestine to name a few), hydrochloric acid breaks down food and, along with a number of enzymes and actions, is reduced into nutrients (carbohydrates to simple sugars, fats to fatty acids, and proteins to amino acids) your dog’s cells use to transport, feed, and cleanse the body.